Have you heard about CreativeMornings? It’s an international monthly breakfast lecture series specifically for creative communities (hence the title). 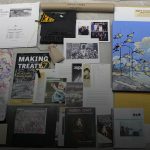 Founded in Brooklyn in 2008 by Tina Roth-Eisenberg (a Swiss designer based in NYC) to bring together creators, designers, photographers, illustrators, and artists for inspiration, collaboration and learning. Lectures are held monthly on a Friday morning over breakfast (8:30-10 A.M.) with the goal of hosting a city’s creative community and encouraging meaningful conversation while being inspired by a guest speaker. The topics of the lecture series range from education and urbanism, to bravery and food and true to the spirit of community and collaboration, they’re all filmed and posted online for public access. Sounds pretty cool right? But NYC is so far away…if only there was a chapter closer to home. Good news. 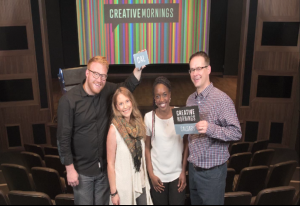 CreativeMorning are hosted in 108 cities across the world, including here in Calgary. And we’re especially excited because the Calgary chapter of CreativeMornings has a new home for their events at cSPACE King Edward. But wait, that’s not all: CreativeMornings monthly events are free and open to anyone who shares a passion for recognizing and celebrating the best this city has to offer. Just register online to secure your spot and then show up on Friday ready to get creative, inspired and make some new friends. To learn more about this month’s theme (Moments), meet the speaker (Lisa Gareau, Candy Event Consulting) and/or register for a spot, visit the CreativeMornings Calgary Chapter online. And visit the cSPACE King Edward Events page so you don’t miss any of the awesome upcoming events! Hope we see you at a CreativeMornings event at cSPACE King Edward soon!